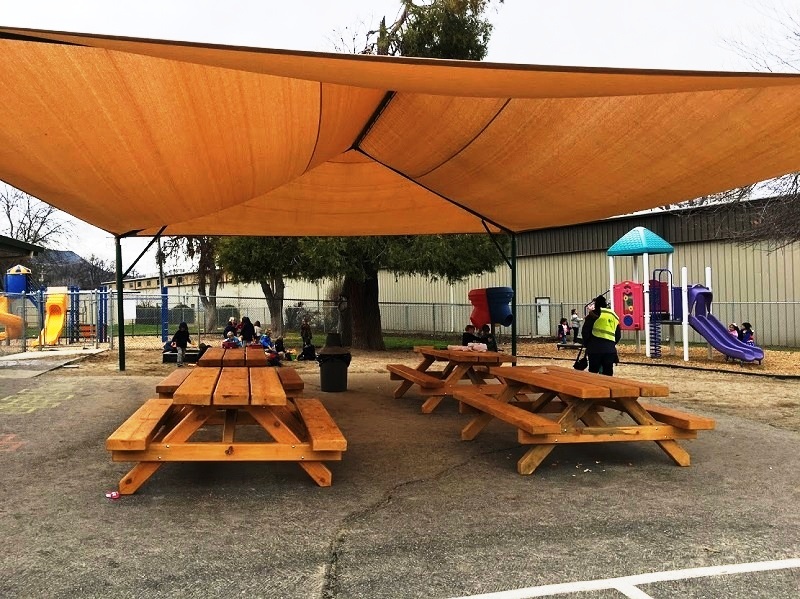 OAKHURST — “These picnic tables are huge!” exclaim dozens of kindergarten students at Oakhurst Elementary School. The students are enjoying their new playground picnic tables purchased by the Oakhurst Elementary Parent/Teacher Club (PTC). 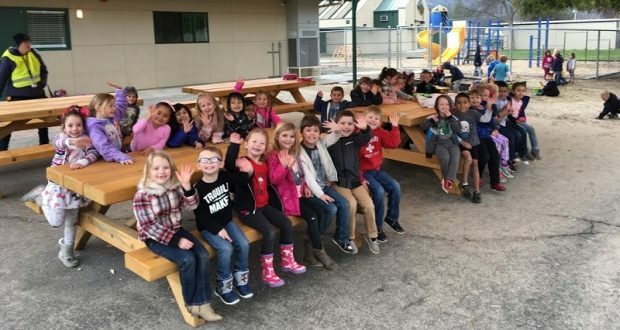 “We love our new picnic tables,” shares kindergarten teacher Karen Forbes. The unique picnic tables are made from Ponderosa pine logs hewn from trees salvaged from state and federal forests and then hand-crafted into picnic tables, held together with industrial-grade steel bolts. With the assistance of Fire Captain Nate McCarthy, these tables were purchased from the Growlersburg Conservation Camp. The Growlersburg Conservation Camp began operations in 1967, and is jointly operated by the California Department of Corrections and Rehabilitation (CDCR) and Cal Fire. Nestled in the woods north of Georgetown, California, the crew has been putting out fires for the past 31 years. The camp initially housed 80 CDC inmates to work as hand crews for fighting wildland fires and other public service projects. Currently, the camp has a maximum population of 132 inmates who work in assignments devoted exclusively to serving the community, local, state and federal agencies in wildland fire suppression, as well as responding to other emergencies. The CDCR website for Growlersburg says crews log about 400,000 work hours each year and 100,000 hours of emergency response. When the crew isn’t fighting fires, they are busy providing community service. The camp has two mobile dimension sawmills that produce stock to build picnic tables that are sold to a variety of public agencies. The tables are built to last, and even come in children’s sizes. They make everything onsite, from start to finish. OES offers a big thank you to Mr. Gene Karnes who graciously donated his time, truck and trailer to pick up and deliver these tables, as well as PTC volunteers who unloaded the tables. Kathleen Murphy is the principal of Oakhurst Elementary School. OES is part of the Bass Lake School District.